For a private villa, what you need is an exclusive property to call your own, which is close to the beach and provides the utmost comfort to its guests. 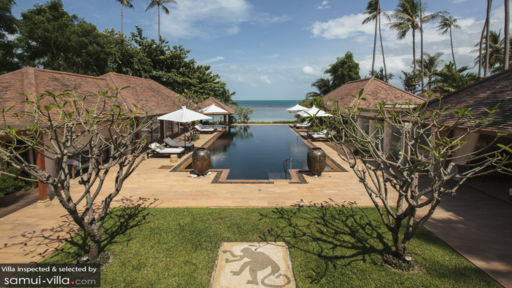 Villa Baan Wanora on Bang Kao Beach is all this and much more with its five bedrooms, vicinity to a secluded beach, and tropical interiors to celebrate the lush nature that surrounds its walls. Perfect for both families and friends, the lavish property offers a fun and inspired time to guests to enjoy themselves, relax, and rejuvenate in a natural and breezy ambiance. The stunning master bedroom features walls made of glass, a four-poster king-sized bed with sheer, white drapes luxurious cushions and a private living area with comfortable sofas and a pool-view. A flat-screen TV and an antique writing desk can also be found in the bedroom. The air-conditioned bedroom also has an en-suite bathroom, fitted with necessary amenities. The four bedrooms are furnished with a selection of king-sized, queen-sized and single beds along with daybeds. Each bedroom is beautifully decorated and has an en-suite bathroom for your convenience. 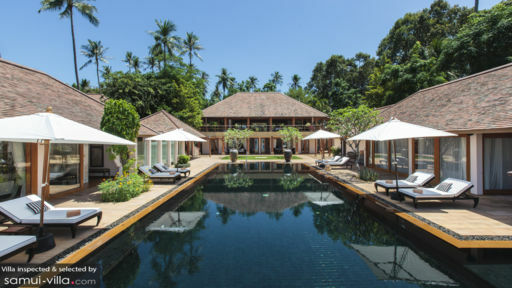 A natural, dark-stone tiled swimming pool resides outdoors at Villa Baan Wanora and its massive size ensures that you have a glorious time swimming laps in its cool waters. The beach is right at your doorstep, and all you need to is walk a few steps downwards. You can view the ocean and the sandy shores from where you stand. Several sun chairs are placed on the pool deck, where you can lie back and relax under the tropical sun, work on your tan or simply read a good book in the peaceful atmosphere. With sun chairs placed under large parasols, the outdoors make for a pretty sight where you will feel rejuvenated and you can recuperate to your hearts’ content. Beachside, you will find a traditional sala housing a rustic, wooden dining area with stunning views. The two-storey Villa Baan Wanora features living and dining spaces on each of its floors and both the rooms are open-concept to allow for the fresh breeze to flood the rooms as well as some natural sunlight to illuminate its corners. The living spaces are designed and decorated with a traditional Thai touch, with high-vaulted wooden ceilings, muted lighting, Buddha statues, rustic interiors, striking artwork donning the walls of the room and statement chandeliers. They are comfortably furnished with wicker chairs, plush white and grey couches, outdoor sitting with chairs and tables, vibrant cushions, coffee tables, and massive televisions for entertainment. A dining area comprises a ten-seater, square table overlooking the beautiful outdoors at the villa. A western kitchen which is fully-equipped with modern appliances and amenities is at your service and ready for use as well. The accommodating staff at Villa Baan Wanora can make arrangements on your behalf and will welcome with you a pleasant smile. They can arrange for in-house massages, babysitters, baby cots and other services, at additional cost. You are offered a complimentary daily breakfast to start off your day with a wonderful kick. If you wish, you can request for lunch or dinner, at extra cost, as well. 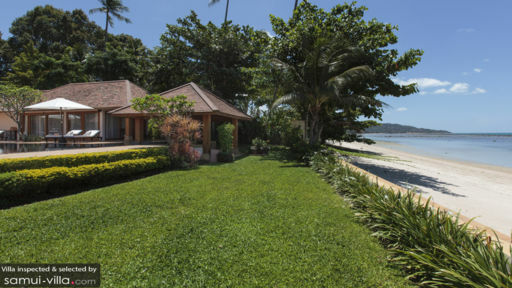 The villa is situated right next to Bang Kao beach so that you have the convenience of enjoying the sun and sand as much as you want. Visit the Laem Sor Pagoda, a stunning structure celebrating Thai heritage. Many restaurants around the villa offer delicious local food as well as international cuisines.